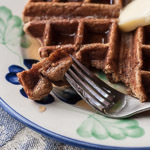 Thanksgiving day breakfast is made to be special, especially if you have family or friends visiting, but it doesn’t have to be difficult or time consuming. In fact, we try to keep breakfast simple on big feast days just because we have so much other cooking business to attend to. Often I make breakfast the night before and warm it up in the morning. 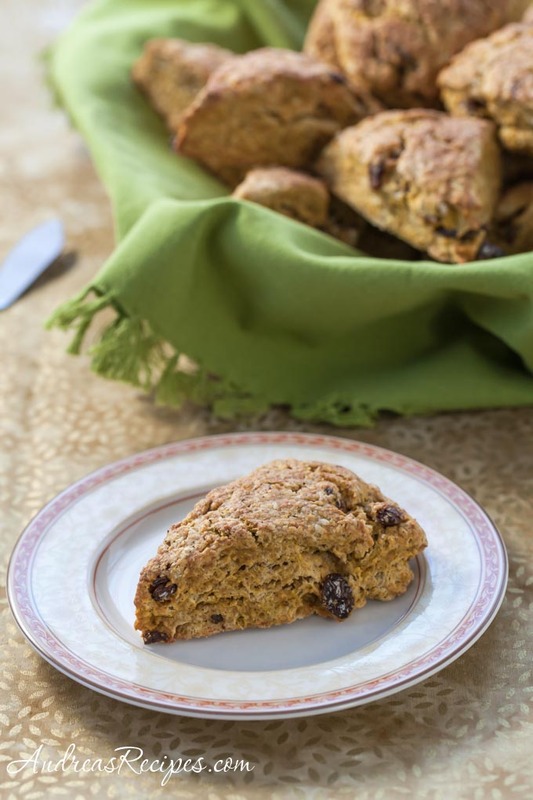 Scones and muffins are easy breakfasts that hold up well overnight and taste delicious in the morning with hot tea, coffee, or mulled cider. 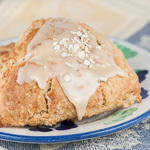 I adapted these pumpkin scones from my cherry sour cream scones recipe. 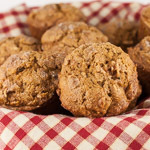 The pumpkin puree acts as a binder and keeps the scones just moist enough to hold together, while the milk and cinnamon sugar on top gives a satisfying crunch. In food processor bowl, mix the flour, sugar, baking powder, baking soda, salt, cinnamon, ginger, and cloves. Add the pieces of butter and pulse about 10 to 12 times. The mixture should resemble coarse cornmeal. Pour the flour mixture into the large mixing bowl and add the raisins. Stir in the pumpkin mixture until large dough clumps form. Press it all together with a spatula, making sure you don't have any loose bits of flour. For a quick breakfast, make them the night before and wrap in a tea towel when cool, then warm in the oven in the morning. Annie makes some pretty good scones too, and I have some leftover homemade pumpkin puree from a pumpkin cheesecake project. I think I’ll combine the two with your idea for pumpkin scones! Hey, you’ve been tagged! Come visit our site for details. 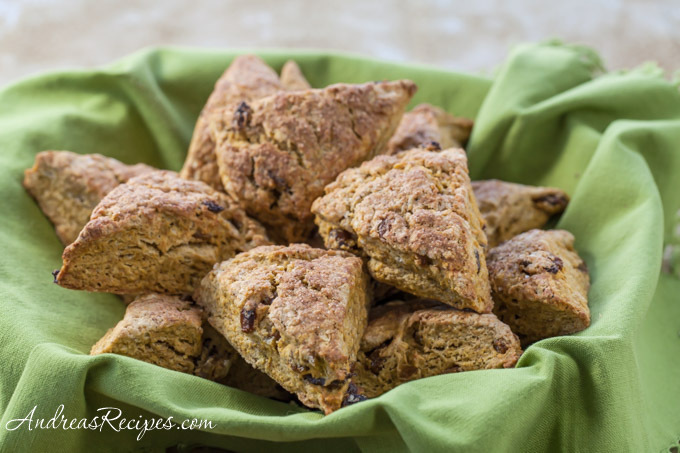 Hubby loves scones, these ones are perfect for the season! I think I am making these tonight for the girl’s breakfast in the morning. Love it! Just wanted to let you know that I really enjoyed hosting this GYO #21 and have just posted the roundup. A bunch of delicious and informative posts, that’s for sure. I would be honored to host another round in 2009 if you are looking for more guest hosts.